Great way to use up the leftover sock yarn! Or at the very least, won’t add much weight to your stash. This project looks best with many colors of yarn…perfect for KAL swapping! Pattern is simple & easy to memorize. You could easily use this method to knit a smaller project (scarf, wrap, purse, etc). Sock yarn makes a lovely light-weight blanket that is easy to care for. Everyone needs a blankie and this project will remind you of your awesome, super powers! You have to be slightly crazy to knit a blanket with sock yarn! 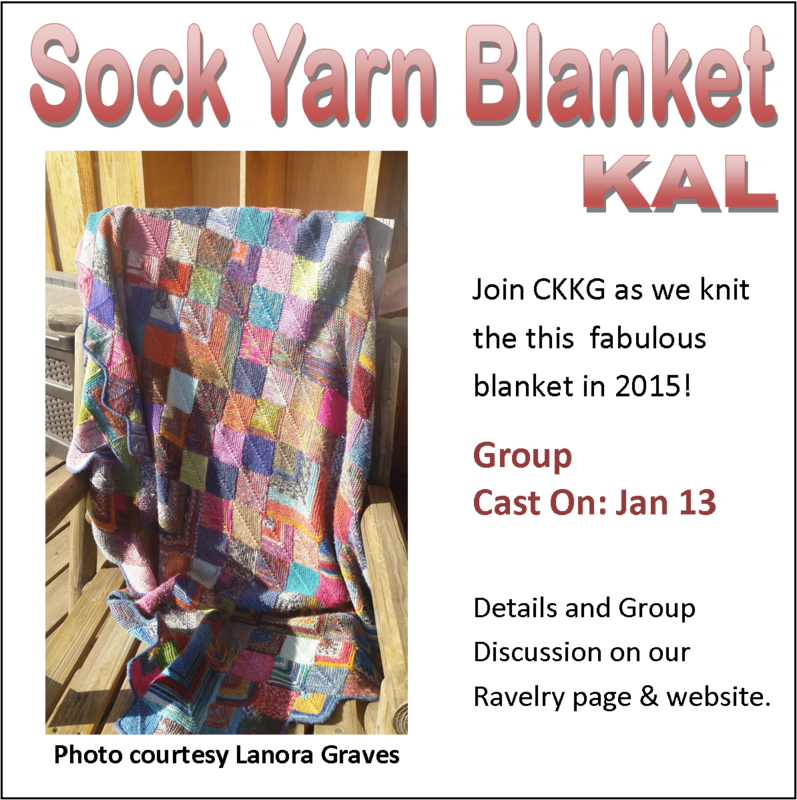 Lisa and Lanora have organized a super fun KAL to kick off 2015! This KAL is open to any knitter, the more the merrier-membership not required! Prizes will be (random drawings from KAL participants listed on our Ravelry Group page) given out at each monthly meeting (must be present to win). 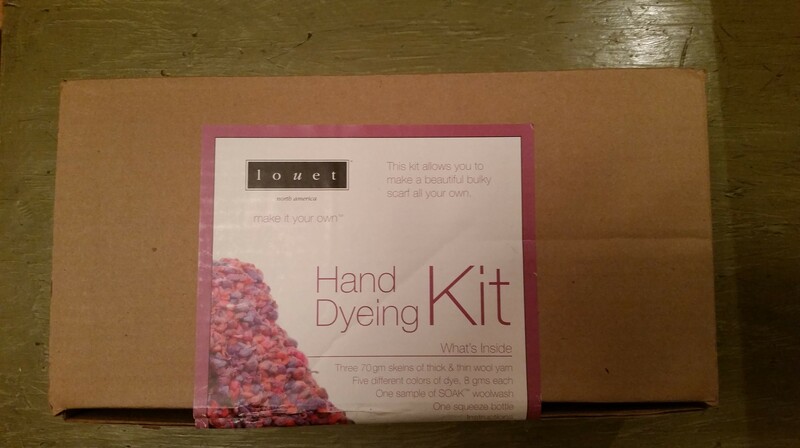 CKKG Members will also be eligible for a Louet Hand Dyeing Kit that was donated by the generous Julie from the Newton Beadery! The kit will be given away at our February Guild meeting (random drawing from participants-you don’t have to be present to win)! If you join CKKG during Jan & Feb, your membership will be extended through March 2016! An annual membership is only $25 (student discount available). Details can be found on the About page. Come check us out, friends are always welcome!! We will cast on our first mitered square at the January Guild meeting (Jan 13) and Lanora will walk us through the simple pattern and tips. Please bring: yarn you want to start your blanket with (sock-weight yarn) and needles ranging from #1-4’s (depending on how tight you knit/desired drape) – we’ll provide assistance & suggestions, crochet hook of similar size & as many mini-skeins as you would like to swap. This is a long-term KAL…it will continue to swap until people stop! The group motivation (and a little competition) will hopefully help keep you on track. There will be all sorts of fun prizes along the way (we have 30 donated project bags that are perfect size for this project & other fun items). Happy New Year and see you in a few weeks! Previous Previous post: December Holiday Party! Next Next post: Knitting Guild meeting Tuesday!